• First performed at the Adelaide Drama Festival, 1949. • Broadcast on radio by the Australian Broadcasting Commission on 28 February 1949. • Selections published in The Golden Lighting, Jindyworobak, 1953. • Published in On The Air: Five Radio and Television Plays, Sydney: Angus & Robertson, 1959. • Published in Colin Thiele's Selected Verse, Adelaide: Rigby, 1970. The play 'Burke and Wills' is written in free verse, with the main narrative passages by King in more formal and rhythmic lines. The story of the terrible journey of Burke and Wills and its fearful end is well known and contains all the tragic drama and suspense that a playwright could wish for. The fascination of the events lies in the fateful and almost unbelievable near misses that dogged the expedition - Brahe's departure after waiting for three months, only nine hours too soon; Gray;s death and the day lost burying him; the failure of Brahe and Wright, when they returned, to see any signs of occupation or to re-open the cache at the depot; Burke's decision to reach Mount Hopeless instead of following the old route to the Darling. If any of these things had not happened the party might have been saved. Often they were on the verge of rescue when fortune turned against them. The characters too - the weak and shiftless Wright, headstrong Burke, gentle Wills, loyal King, anxious Brahe - provide variety and contrast fitting for the story in which they take part. • It was first performed at the Adelaide Drama Festival, 1949. • Selections were published in The Golden Lighting, Jindyworobak, 1953. 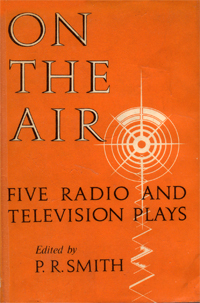 • It was published in On The Air: Five Radio and Television Plays, Sydney: Angus & Robertson, 1959. • It was published in Colin Thiele's Selected Verse, Adelaide: Rigby, 1970. And the value of life is lost in its ponderous space. When a second is age, and an hour immeasurably old. Striding unslaked over its thin, dead streams. Veiling my body that is drifting into dreams. Of my shrunken body drifting into dreams.